Habit: Annual to perennial herb; rarely dioecious (Silene), taprooted or rhizome generally slender. Leaf: simple, generally opposite (subwhorled), entire, pairs at nodes often +- connected at bases; stipules generally 0; petiole generally 0. Inflorescence: generally cyme, generally open; flowers 1--many; involucre generally 0 (present in Dianthus, Petrorhagia). Flower: generally bisexual, radial; hypanthium often present but obscure; sepals (4)5, +- free or fused into a tube, margins generally scarious, more so on inner 2 or not, tube generally not scarious, awns generally 0; petals (4)5 or 0, generally tapered to base (or with claw long, limb expanded), entire to 2--several-lobed, limb generally without scale-like appendages adaxially, generally without ear-like lobes at base; stamens generally 10, generally fertile, generally free, generally from ovary base; nectaries 0 or 5; ovary superior, generally 1-chambered, placentas basal or free-central, styles 2--5 with 0 branches or 1 with 2--3 branches. Fruit: capsule or utricle (rarely +- dehiscent), generally sessile. Seed: appendage generally 0 (present in Moehringia). Genera In Family: 83 or 89 genera, 3000 species: widespread, especially arctic, alpine, temperate northern hemisphere; some cultivated (Agrostemma, Arenaria, Cerastium, Dianthus, Gypsophila, Lychnis, Sagina, Saponaria, Silene, Vaccaria). Note: Apetalous Caryophyllaceae can also be keyed in Rabeler & Hartman 2005 FNANM 5:5--8. Habit: Annual, perennial herb, erect to mat-forming, taprooted or rhizomed. Leaf: blade thread-like to awl-shaped or narrowly oblong; veins or ribs 1--3. Inflorescence: terminal or axillary, open to +- dense; flowers 1--many; peduncles, pedicels 0.5--35+ mm. Flower: hypanthium short, obscure; sepals 5, +- free, 1.9--7 mm, +- lanceolate to ovate, glabrous to glandular-hairy; petals 5 or 0, 0.7--10 mm, entire or notched; stamens on an obscure to prominent disk; styles 3, 0.3--2 mm. Fruit: capsule, narrowly ovoid to widely elliptic; valves 3, ascending to recurved. Seed: 1--many, red-tan to red-, purple-, or black-brown. Habit: Perennial herb, mat-forming, 5--20 cm, generally glabrous, glaucous; taproot > 3 mm diam; rhizomes, trailing stems 5--20+ cm. Stem: in flower ascending to erect. Leaf: 4--15 mm, +- 0.5--1.2 mm wide, > internodes, needle-like, straight or curved, +- flexible, +- evenly spaced; axillary leaves well developed. Inflorescence: often glandular-hairy. Flower: sepals 2.5--4 mm, acute to acuminate, margin not incurved, vein 1, faint; petals 1.4--2.2 × sepals. Seed: 2.3--2.8 mm; margin thick, red-brown to brown. 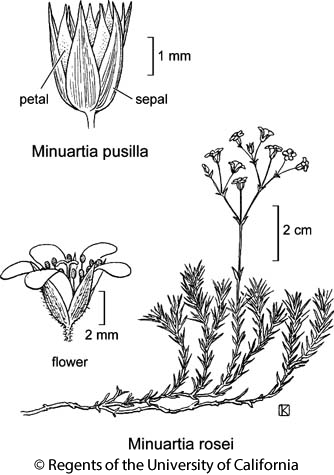 Citation for this treatment: Ronald L. Hartman & Richard K. Rabeler 2012, Minuartia rosei, in Jepson Flora Project (eds.) Jepson eFlora, http://ucjeps.berkeley.edu/eflora/eflora_display.php?tid=33768, accessed on April 19, 2019. KR, NCoRH. Markers link to CCH specimen records. Yellow markers indicate records that may provide evidence for eFlora range revision or may have georeferencing or identification issues. Purple markers indicate specimens collected from a garden, greenhouse, or other non-wild location.